Jason gets a Jeep Renegade Trailhawk! In my life a lot of rather big things happen rather suddenly. For example, two weeks before I landed in Seoul, South Korea, I had never been abroad before, I was about to attend Claremont Graduate University's PhD program in California, and it had never crossed my mind to work overseas. Not quite as dramatic as that, but in a similar fashion, getting a SUV to better match my work and personal lifestyle here in Albuquerque, New Mexico as a professional photographer and certified drone pilot, had only fluttered across my mind a few times. I was not even sure if it would be possible as I still had payments left on my 2013 Mazda3 sedan, which I totally loved and had zero problems with in owning it for 42,000 miles. In my work for Hemingway Land Company going to remote, off road places to make 4K drone videos and photos of rural land properties, I often had to rent a big 4x4 truck from Enterprise. The last time I had to do this they had a Jeep Renegade Trailhawk available so I asked, can I have that instead of a massive pickup truck? It was love at first drive! It performed great on the off road part of the rural land photo shoot, and was fun and nimble to drive in the city. Sunday morning I returned the Jeep to Enterprise, and went right to the local Jeep dealership! I compared it to the Jeep Compass, but did not like that at all. It did not feel like a Jeep to me. I knew it was a Renegade Trailhawk for me! None of those available at the Jeep dealer though. So I began an extensive 500 mile radius search as it seemed I'd need to go to Denver or Tuscan. In the end I found the exact same model/color Trailhawk I had rented just 2.5 miles away at Morning Star Motors. Aaron Hopper spent a lot of time working with me to get the numbers of the deal just right, as it was a little complicated with my Mazda3 trade in. Exactly a week after picking up the rental Trailhawk at Enterprise, I picked up my very own glacier (silver) Trailhawk at Morning Star Motors! 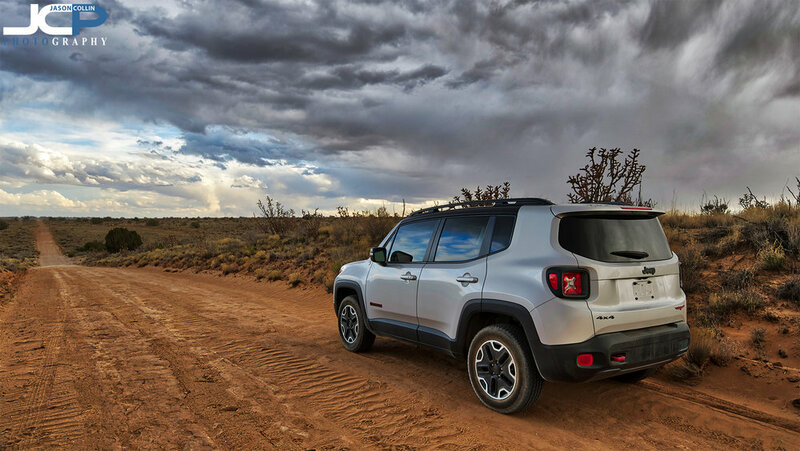 The Jeep Renegade Trailhawk out on its first rural land property shoot with me in very remote Rio Rancho, New Mexico on a stormy evening. I soon got to test out my new Jeep Renegade Trailhawk on a rural land property shoot in remote Rio Rancho. It had no trouble on the dirt roads getting me out there. With a thunderstorm just to the west, I was not worried about any weather conditions for a change because I new the Trailhawk would get me home safely! Still, as much as it was love at first drive with the Jeep, it was bittersweet trading in my Mazda3 sedan which was a car I loved very much, and was very faithful to me through challenging conditions. It was the car that finally got Kiki and I out of Florida and to the west. I hope it goes to a good home. If you want a pain free car buying experience with a very transparent process, then be sure and ask for Aaron at Morning Star Motors! More photos from remote New Mexico of the adventures I go on with the Jeep Renegade Trailhawk to come!